Created by: Dwayne McDuffie and Denys Cowan. Notes: Raquel is the protagonist of the series titled Icon. She’s also the first teenage single mother superhero ever and to this date the only one. Skills and Abilities: She is a gifted writer and high school gymnast. Powers: Inertia belt allows her to manipulate kinetic energy for a variety of effects. Raquel Irvin was born on Paris Island the poorest ghetto in Dakota. Growing up she was best friends with Darnice all the way through to High School. Raquel had aspirations of being a writer, like her favorite author ‘Toni Morrison’. However what she lacked was the motivation to write. She briefly dated a boy named Noble with whom she tried to rob a wealthy upstate mansion. Here she would find her motivation in the form of Augustus Freeman, lawyer by profession, alien superhuman in disguise. Augustus gave the thieves a speech about what they had down. Moved by this Raquel went home drew up costumes, picked out names, tracked down Augustus at work and managed to move him from passive superhuman to active. Icon created the costumes and presented her with the ‘Inertia Winder’. They made their first public appearance when the mayor was captured by Payback (Icon #1, 1993). Rocket would then prove instrumental in defeating Payback and she learned she was pregnant (Icon #2-3, 1993). They later battled the Blood Syndicate. While battling the syndicate, Wise Son expressed interest in her. They also learned the secret of the “Big Bang”. Raquel’s feistiness’ also caused Wise Son to announce a truce between then and the duo. This was also where she got her domino face mask (Icon #5-6, 1993). When dealing with her pregnancy she considered an abortion and even attended the clinic but changed her mind, instead deciding to own up to her ‘mistake’ and not take the easy route out (Icon #7, 2013). After Noble accidentally informed her mother she was pregnant she had to let her family know she was not having an abortion (Icon #10). When Lysistrata Jones took control of BuckWild and sent him after the duo she was the one to stop the villainess when even Icon fell under the power of her ‘P-Whip’ (Icon #13). While she was pregnant she had her belt stolen which lead to a thief becoming a super powered villain luckily Icon managed to fix things (Icon #14). During ‘Worlds Collide’ she bonded with Superboy (Icon #15). When Icon left earth she wrote down his entire life in hopes of having it published one day (Icon #18). She battled Bulletproof while she was about seven months pregnant and realized that she had to find a temporary replacement. 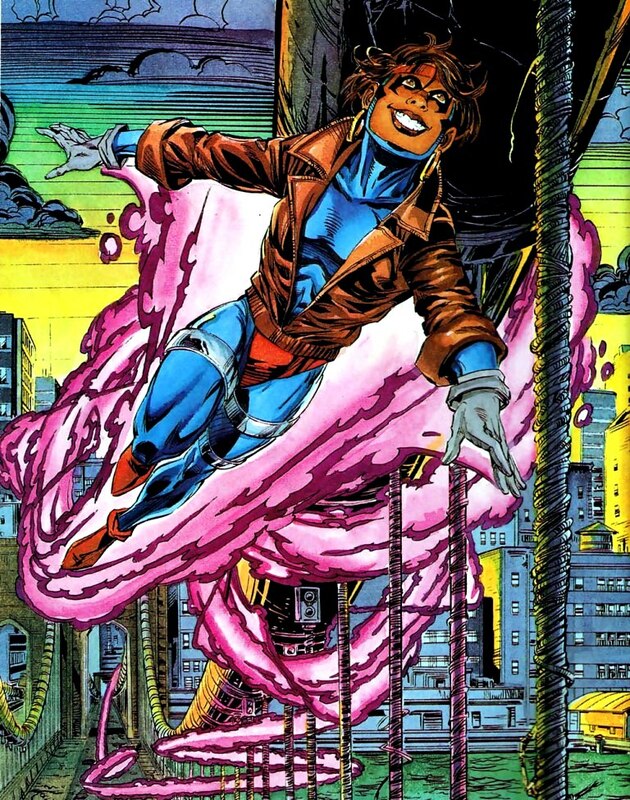 Best friend Darnice would then take over as Rocket (Icon #19-20). She later gave birth to her son “Amistad” named after the famous slave ship and helped Flashback of the blood syndicate to quit her cocaine addiction. There is at least one other teenage single mother superhero: Miriam Delgado, Mirage, a former member of the Teen Titans.